Children can create toys using the world around them with Toyi. More play means more imagination. That's the thinking behind Toyi, a creative play kit that sees children become toy designers. 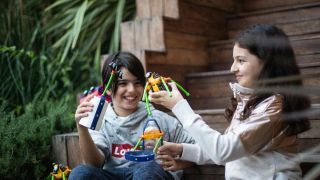 Created by Ögeday Uçurum and Elif Atmaca, Toyi encourages kids to develop their design thinking by upcycling everyday objects and transforming them into creatures, rockets, and anything their imaginations can come up with. Designer Atmaca came up for the idea of Toyi based on her experiences as a child of moving from city to city and not having traditional toys of her own to play with. This experience tuned her in to the needs of children, which she's brought to the design of Toyi. Each Toyi kit includes seven different parts, including flexible connectors, eyes and hands, which are designed to wrap around objects and turn them into creative toys. As Atmaca puts it, "play is the most natural and powerful tool to develop children's creativity". Whereas 'traditional' toys have a shelf-life and limited use, Toyi follows in the footsteps of open-ended, multipurpose toys like LEGO in that the imagination of the user is key to getting the most out of it. Toyi's reliance on everyday objects is a great added touch, though, as it prompts children of all ages to see the world around them anew. Check Toyi out in action with the video below. Like the look of Toyi? There's still time to back the development of the kit over on Kickstarter, with perks including a bespoke playbook and an Ambassador Pin. What's more, Toyi believes that every child has the right to play. To this end, Uçurum and Atmaca have teamed up several civil society organisations around the world to send a Toyi kit to disadvantaged children. So even though the project has already smashed its funding target with time to spare, your donation could still go a long way and change the life of a child.